Calibur11, creators of custom Xbox 360 Vault cases, today announced the Gears of War 3 Vault for the Xbox 360 Slim system. Encase your Xbox 360 in the Gears of War 3 themed design, which also serves in cooling and stabilizing your Xbox 360, as well as reminding you when it is time for vengeance. A unique in-game integration makes your Xbox 360 glow fiery red each time you are killed in Gears of War 3. The Gears of War 3 Vault retails for $89.99, which will be available at retail stores such as Best Buy and online during the September 2011 launch of Gears of War 3. See more pictures and details of the Gears of War 3 Vault here on www.calibur11.com. Along with the news of this unique Xbox 360 system add-on, one Gears of War 3 Vault will come packed with a very unique prize: a life-size Gears of War COG Armor suit. One lucky winner may find the code in the Gears of War 3 Vault box. Take a look at the COG armor suit and details on the giveaway here on calibur11.com. Imagine arriving at your Halloween party, or Gears of War 3 tournament, with that. 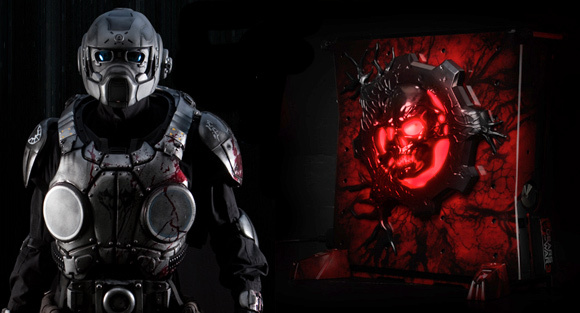 Visit calibur11.com for all the details on the Gears of War 3 Vault and COG Armor.